US President-elect Donald Trump must be given a chance to lead, his defeated rival Hillary Clinton has said. Appearing in public for the first time since conceding, the Democrat said she hoped Mr Trump would be a successful president for all Americans. 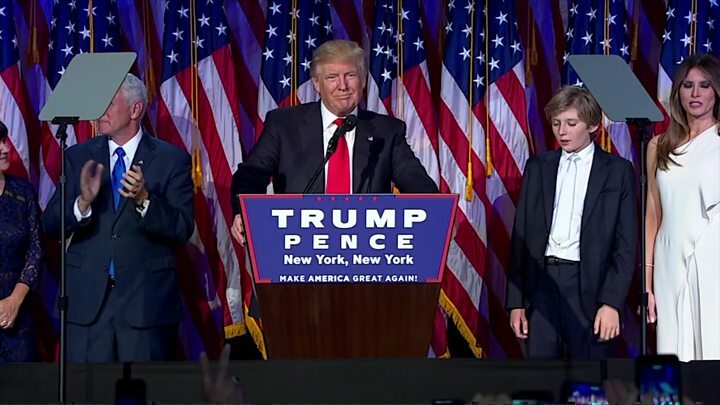 The Republican will become the 45th US president after an astounding victory which followed a divisive campaign. He holds his first transition meeting with outgoing President Barack Obama at the White House on Thursday. The president-elect has said his immediate priorities are restoring the country's infrastructure and doubling its economic growth. After losses overnight as Mr Trump's surprise victory became clear, markets rebounded and a feared meltdown failed to materialise. 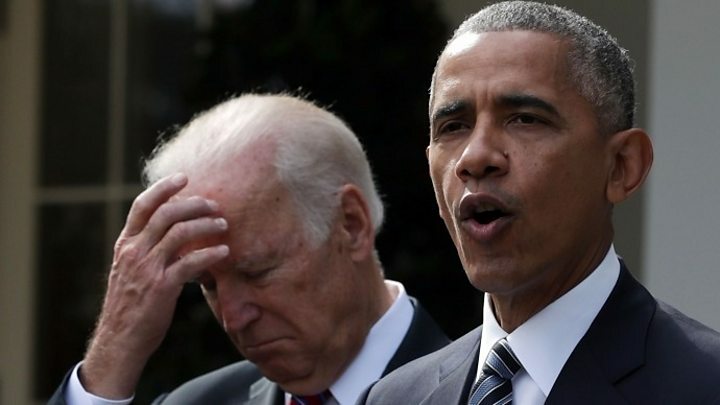 Mr Obama, who congratulated his successor in a phone call in the early hours of the morning, said it was "no secret" that he and Mr Trump had pretty significant differences. Mrs Clinton also urged her supporters to respect the election result, saying the constitution enshrines the peaceful transition of power. "I'm sorry that we did not win this election for the values we share and the vision we hold for our country," Mrs Clinton told her supporters in her address in New York. "We have seen that our nation is more deeply divided than we thought." "We have still not shattered that highest and hardest glass ceiling. But some day, someone will." "To all the little girls watching... never doubt that you are valuable and powerful and deserving of every chance and opportunity in the world," she said. Mr Trump told cheering supporters at his campaign rally in the early hours of Wednesday that Americans must now "bind the wounds of division", after the gruelling, acrimonious electoral battle. "I want to tell the world community that while we will always put America's interests first, we will deal fairly with everyone," said the real estate mogul, former reality TV star and political newcomer. House Speaker Paul Ryan paid tribute to his fellow Republican, saying he had "turned politics on its head" and would lead a unified Republican government. From January the Republicans will control the presidency and both houses of Congress - defying pollsters' predictions. Mr Ryan, a lukewarm supporter of the president-elect, said their party's strong showing in elections to the Senate and House of Representatives was thanks in no small part to Mr Trump. He referred repeatedly to Mr Trump's running mate, Mike Pence, as "my good friend" and "a good man". Mrs Clinton's running mate Tim Kaine paid tribute to her as "a history maker" and said that it was "uniquely difficult" to be elected to federal office as a woman in the US. 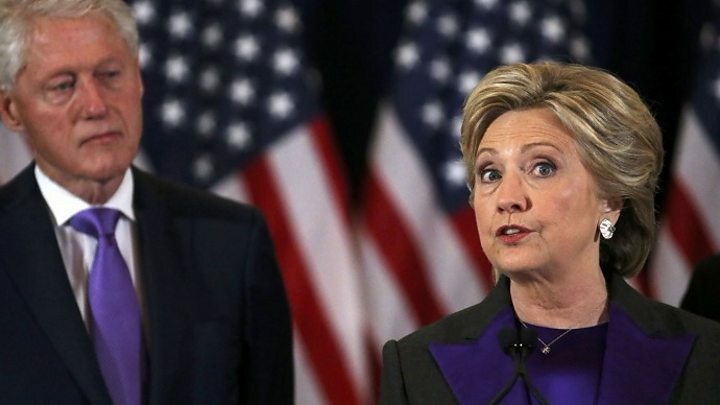 US media report that Mrs Clinton is ahead in the popular vote, albeit by less than 1%, though Mr Trump carved a path to victory through the electoral college. The last time the defeated candidate won more votes cast than the person elected president was in 2000, when Republican George Bush beat Democrat Al Gore. Mr Trump's election sparked protests in California, with more than 1,000 high school students walking out of classes in Berkeley, as well as smaller demonstrations elsewhere in the state and in Oregon, Washington state and other university locations. The Republican overturned pollsters' forecasts to win in key battleground states including Florida, Ohio and Pennsylvania. Exit polls suggest that he won 58% of white voters to Mrs Clinton's 37% - and did particularly well among white men and white voters without college degrees. His outsize showing with this demographic compensated for his lower appeal to blacks, Hispanics and Asian Americans. On 20 January 2017 he will be inaugurated as president of the United States - the first elected office he will ever have held. What do you want to know about a Donald Trump presidency and how it might affect you?